RDM’s single feed check scanners enable small businesses to efficiently and affordably process low volumes of checks or remittance documents. 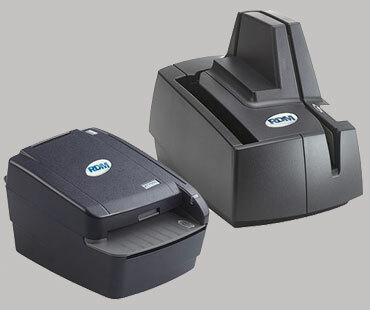 With many available multifunctional options, these check scanners will provide years of reliable service. Compact – Engineered for maximum functionality within a minimal footprint. Multifunctional – The scanners provide functionality of multiple payment devices in a single peripheral unit – meaning that users can scan checks, remittances and read cards all on one device. OCR A and B reader option. Efficient – Incorporates RDM’s industry-recognized MICR and check imaging technologies to consistently deliver precise MICR read rates and premium images that are fully compliant with industry standards. Each unit is factory calibrated before shipping – simplifying the deployment process. Affordable – Whether you are a financial institution with several branches or a retail location; one device provides you with the necessary technology at an affordable price. One of the industry’s longest lifespans.